Nozzles types are just one thing making sprayheads more efficient, professionals say. How and why sprayheads are becoming more efficient. “If it’s not broken, why fix it?” may be the mantra for many landscape and irrigation contractors, but the industry and many clients are changing. Water conservation is a top priority across the country, so it’s important for professionals to update their practices to meet new standards and expectations. Irrigation manufacturers are also changing their products with efficiency at the forefront. They are designing components like sprayheads to better manage water output with elements like pressure regulators and check valves. Here’s a look at what’s driving sprayhead trends, how they’ve advanced and what landscapers can expect to see with these products in the next few years. California, in particular, is under pressure to cut back on water use, but conservation is a hot topic across the country. Water restrictions, regulations and conservation efforts are spreading across the nation, so the need for more efficient irrigation is the driving force behind product updates and new technology. Orlando-based Massey Services offers pest prevention, lawn care and irrigation services for residential and commercial customers. The company had $178 million in 2014 revenue. One way sprayheads are evolving is by incorporating pressure regulators. In fact, pressure regulation is the main advancement with sprayheads Patrick Hibbs sees. He’s product manager of spray bodies and nozzles for Rain Bird. Sprayheads are now available with in-stem pressure regulators, which ensure all the heads are applying water at the desired pressure, instead of having to use the city’s standard water pressure. Being able to regulate pressure can mean savings for the client. For example, each 5-psi reduction in pressure reduces water use by 6 to 8 percent, according to Rain Bird. Some municipalities are even requiring irrigation systems to have pressure regulators, Jones adds. Irrigation installers can further increase sprayhead efficiency by using ones with check valves, which are also becoming standard. “The added check valve eliminates unnecessary drainage from the head,” Jacquard says. Check valves are especially useful if the sprayheads are damaged. The shut-off devices limit the amount of water lost and keep the rest of the system working properly, Goe says. Check valves help prevent water loss in the event a sprayhead is damaged or broken. 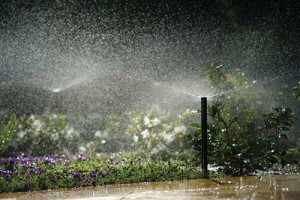 There are other sprayhead advancements designed for water efficiency. For example, some products are changing to work better with different water sources. 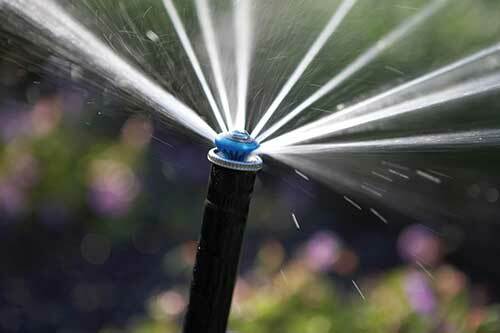 More property managers are turning to reclaimed and graywater to conserve resources. Manufacturers are creating more robust spray bodies and heads to handle those types of water, Hibbs says. Other professionals also have noticed updates beyond the sprayhead. “Most of the advancements in sprayhead technology have come from the different types of nozzles now available,” says Todd Wilson, irrigation manager at Native Land Design in Cedar Park, Texas. Wilson says the MP Rotator nozzle and system monitoring options have made a big impact for him. Wilson works in the company’s Houston branch. The $11 million, full-service company also has a location in McAllen, Texas. Creating water-efficient sprayheads will remain on manufacturers’ agendas, Jacquard says. These updates save customers money and conserve water, two selling factors for contractors. While installers can purchase pressure-regulating sprayheads with set psi levels, regulators with some level of customization or adjustability may be available in the future, Goe says. There also will be a continued focus on the benefits of efficient products, such as high-efficiency nozzles. With manufacturers continuing to release more efficient components and products, Goe says it’s important for users to become more educated on the new options going forward.